Dr. Erlendur Haraldsson is Professor Emeritus at the University of Iceland. I first met him in the mid 1980s when he was visiting the Division of Parapsychology (now Division of Perceptual Studies) of the University of Virginia, where I used to work. In addition to the articles listed in the links below, Erlendur has published several books. Some of them are At the Hour of Death (with Karlis Osis), Modern Miracles: Sathya Sai Baba, and The Departed Among the Living (for more information click here). Erlendur’s page has links to articles about psychic experiences and folk beliefs, apparitions, hallucinations and alleged contacts with the dead, Icelandic mediums, experiments, Sai Baba and Indian miracle makers, and children who speak of a previous life. His work in parapsychology has covered many areas: experiments, surveys, individual case studies, the examination of historical cases, and has ranged from documenting the occurrence and features of phenomena to studying their relationship to other things, such as psychological variables. 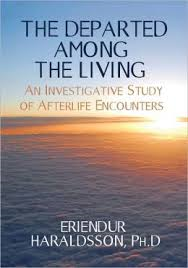 In addition Erlendur has distinguished himself for his study of phenomena relevant to the issue of survival of death: apparitions, mediumship, and reincarnation-type cases. His work has been a valuable contribution, and one that continues to our day. Thank you for the in depth profile of researcher E. Haraldsson. His work appears to be extensive, interesting and very broad-ranging. I confess to having heard his name, but I’m not familiar with his extensive work. Thanks you. As you and I know, most all research on After-Life questions tend to be of either the psycho-‘physical’ nature of death or of NDE reports. I see little work being done in the area ‘mapping the After-Life (or ‘heavenly’) realms or environments. As a long-time OBE explorer of these experiential realms, I feel the next important research area will be the ‘mapping’ of these ‘upper-level’ environments, using the combined reports of OBE explorers and NDEers comparisons and contrasts. The literature of report descriptions is quite rich for NCEs (and to some degree), OBE explorers, such as Bob Monroe and Robert Bruce. But, no detailed study exists of the Divine or After Life – as a ‘mapping’ project. Their are several Face Book communities where some members seem to have ‘gotten’ to this area of the ‘Great Center of All Being’. Would you be interested in putting together a formidable project such as this? I would certainly understand anyone’s reticence in taking-on such a vast and difficult study project. But, the rewards would be significant to all!